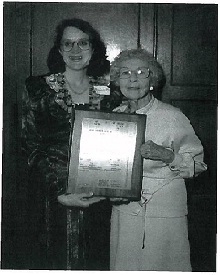 Georgia Ball Travis, AM’31, a former student of Dean Abbott, received the Edith Abbott award at the reunion celebration in June, 1995. Travis, who spent most of her career as a medical social worker, founded in 1992 the Georgia Travis Day Center for Homeless Women and Children in San Jose, California. Travis received her BA from the University of Oklahoma in 1929 and worked for the Children’s Service Bureau in Oklahoma City before coming to SSA.